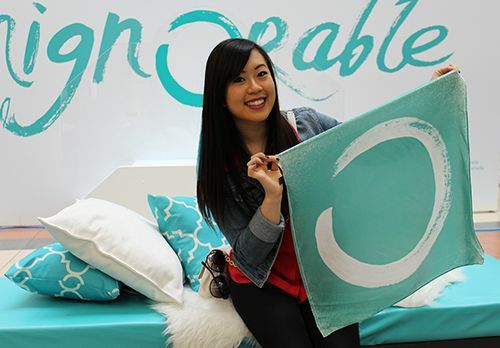 For the month of April, Ovarian Cancer Canada and Edmonton City Centre Mall have been teaming up together to present Teal Tuesdays - events going on over lunch hour to raise awareness for ovarian cancer by making it unignorable. 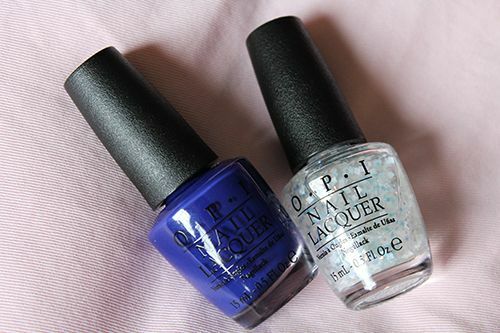 Being a health care professional myself, I know that ovarian cancer is the most dangerous of all gynecological cancers. 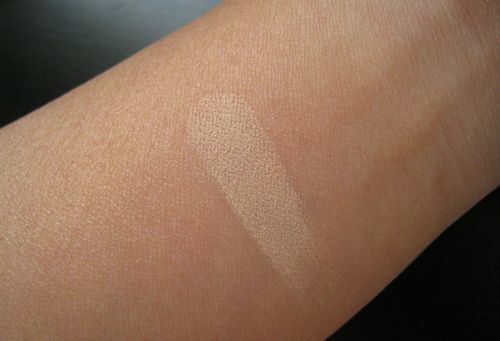 The symptoms can be attributed to a variety of conditions, so when the symptoms become severe, the cancer is typically in the late stage of the disease. 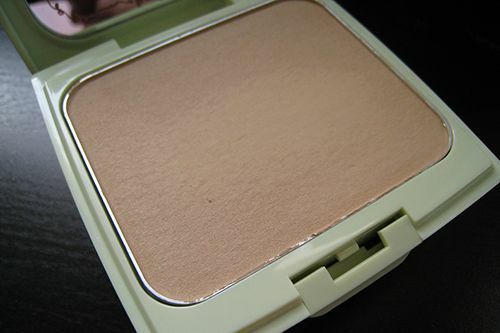 And that is why it is so important to detect the cancer early, as the survival rate is much higher (90%+). 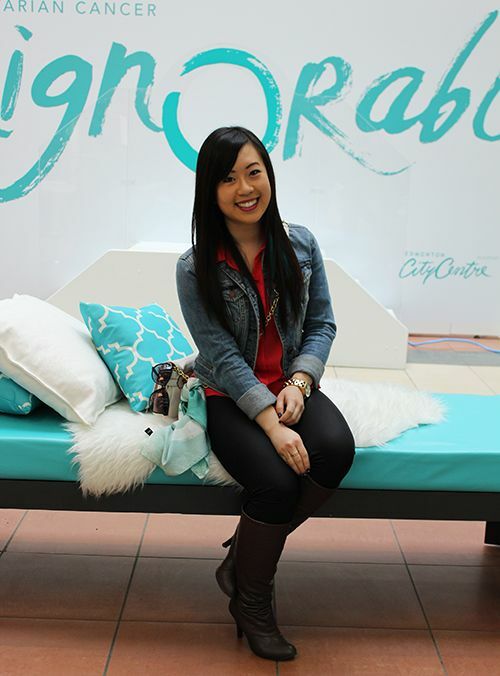 The campaign is a partnership between Ovarian Cancer Canada and Edmonton City Centre Mall. 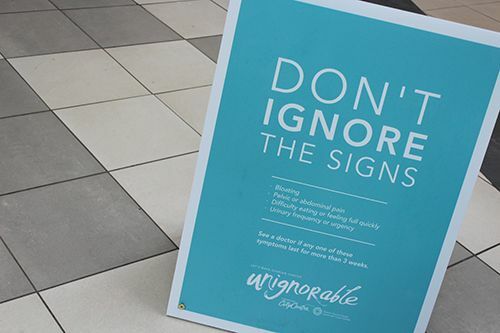 It aims to raise awareness of ovarian cancer, known as the disease that whispers, and provide women with information that can be used to identify the signs of ovarian cancer, which are often difficult to detect. It can be easy to ignore the symptoms of this disease because many of them don’t seem out of the ordinary. Symptoms include swelling or bloating of the abdomen, pelvic discomfort or heaviness, back or abdominal pain, fatigue, gas, nausea, indigestion, change in bowel habits, emptying your bladder frequently, menstrual irregularities, weight loss or weight gain. 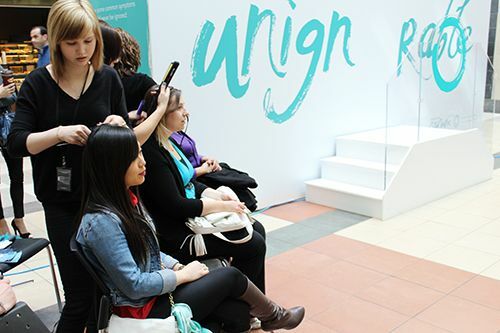 So last Tuesday, I was invited to check out the Teal Tresses event to help raise awareness and show support for the cause - something I was more than happy to attend! Alongside city councillors Kim Krushell and Karen Leibovici and other style bloggers in the city, we each got deal extensions placed in our hair by Eveline Charles stylists to show our support. It was a lovely lunch hour event with a great turnout - many men and women got teal accents in their hair to show their support. 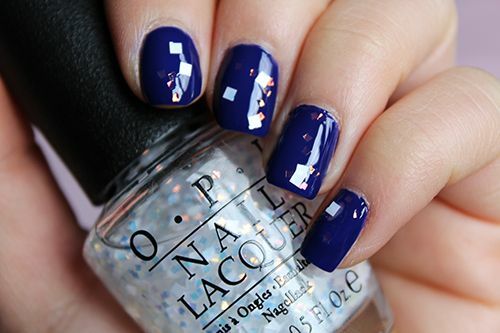 Teal is such an eye-catching colour, no one can ignore it! Tomorrow is the final Teal Tuesday event, where everyone is invited to stop by the teal lounge to enjoy the party, music, and complimentary tea provided by David's Tea. Get your picture taken with the Unignorable display, or pick up the scarf I have above to show your support. Every little bit counts! Edmonton City Centre is also hosting a contest where you can win a $1000 shopping spree - could anything be better? Remember how I said frozen yogurt shops are popping up all over the place like rabbits? Yep, froyo is all the craze and I'm embracing it with open arms. Menchie's just opened up their first location in Edmonton this week, but get ready guys - there are four more coming our way! Menchie's is a self serve yogurt chain based out of California, operating on principles similar to the other frozen yogurt shops in the city. All you do is fill your cup with yogurt and toppings, and pay according to weight, which this shop has set at 55 cents/oz. 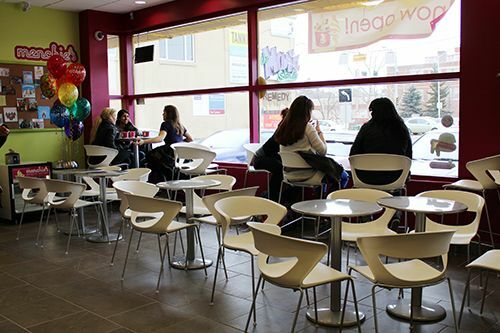 A lot of what determines the success of a business is their location - Menchie's has a prime location within walking distance to the university, a school across the street, and Whyte Ave, which is sure to increase their traffic and profit. I love the pink, lime green, and white that they use to decorate the shop, and there is lots of seating and natural light coming in. I'm sure once classes start up again in the fall, university students will be found working away on assignments while eating froyo. I was lucky to have some time to stop by on their opening day to check everything out. 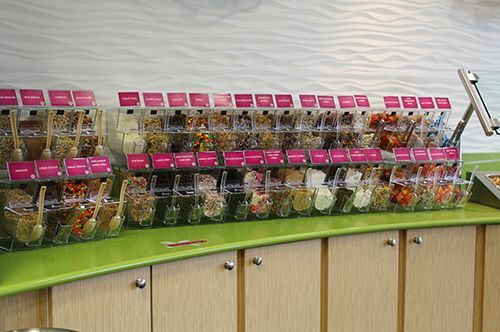 The flavor lineup in Menchie's is impressive, with this shop offering 16 different flavors at any given time. Tart, dairy, and sorbets are available, with about equal numbers of fruit flavours available compared to yogurts inspired by desserts. 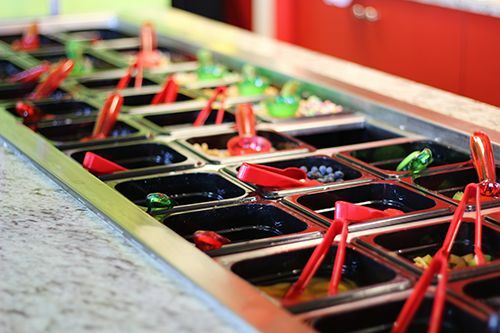 The topping selection is also pretty impressive if you ask me - 40 dry toppings, 12 'wet' toppings and sauces are available in store, making the possible yogurt combinations endless. 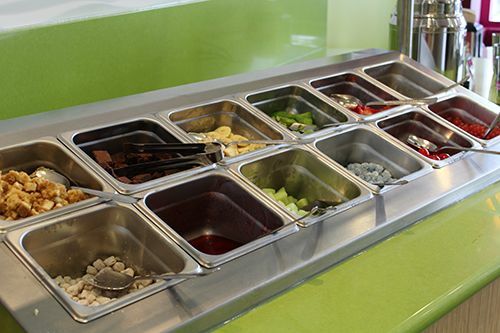 As shown above, the 'wet' toppings bar has offerings ranging from cookie dough balls to mochi and popping boba. As I try to be health conscious and like fruit toppings, I was a little disappointed in the fruit selection available and wish there was a greater variety. Perhaps in the summer as fruit is more in season, there will be more available. After taste testing a few flavours, my froyo mix on that particular day was the original tart & mango sorbet topped with strawberries and blueberry mochi. I loved the tart flavour, as it was quite tangy, moreso than any other frozen yogurt shop I have tried in the past. The mango sorbet was a nice sweet counterpart to the tart, relatively sweet and smooth, but I found it to have a lingering sweet aftertaste, similar to aspartame. The dairy flavours are on the sweeter side, while tart a little more tangy. Another thing to note - the yogurt is smoother and less creamy, less icy and a little more melty, which could be attributed to the use of skim milk. I did an experiment where I froze half my yogurt and sorbet for 5 hours, and upon eating it straight from the freezer, both the yogurt and sorbet were firm, but not hard, making me wonder if there is an agent in the mix to prevent the product from freezing fully. I'm a little bit of a food nerd, but hey, you gotta question what you eat! All in all, the Menchie's experience was pleasant - the place is clean, and there's lots of variety available. They also offer waffle bowls for $1 on top of your yogurt price, so you can change things up from time to time. 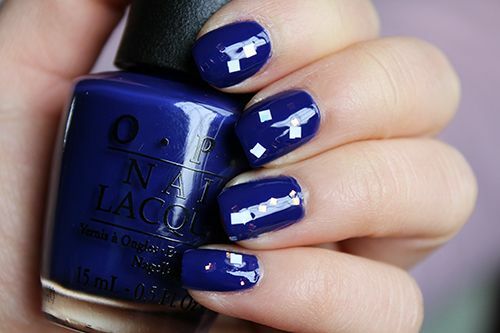 Customer satisfaction is a high priority, as their motto is to make you smile! And they do make me smile, especially with their Smileage Passport program. When you sign up for the program, you receive 1 Smile for every $1 spent. 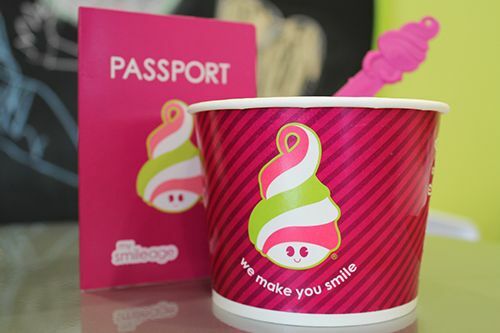 50 smiles equates to $5, which is just about equivalent to a free yogurt, so it pays to collect smiles at Menchie's. With so many frozen yogurt options available here in Edmonton now, you might already have a favourite place. But give Menchie's a try before you make up your mind! 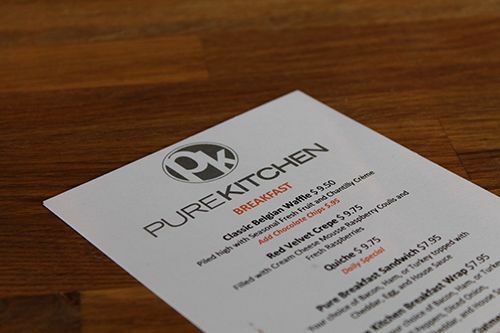 A couple months back, Pure Kitchen came into my radar, and they had prospects of opening around November of 2012. 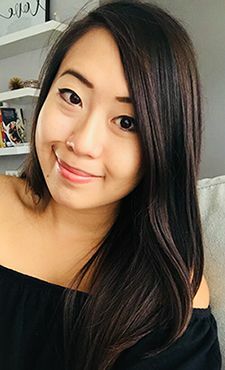 Dates got pushed back further and further, but finally they have opened and are ready to serve up fresh eats in Edmonton! Located just off 124 Street across from Mountain Equipment Co-Op, Pure Kitchen is pretty hard to miss. It's not too big to accomodate a large crowd, but there's lots of natural light to brighten up the space decorated with wood and bright orange accents. Pure Kitchen has a bistro/cafe feel, where you go up to the counter to place your order before taking a seat to wait for your meal. There is the option to have orders to go, but I've always loved being able to sit and enjoy my food in small cafes while getting some work done. Pure Kitchen is no exception, as they provide free wifi and a bright workspace! The Chicken Avocado Club ($8.75) was actually my second choice, but more on that later. 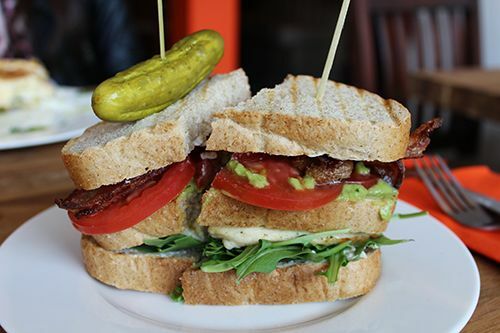 This particular sandwich had pan seared chicken breast, bacon, arugula, tomato, guacamole and herb cream cheese stuffed between three layers of rye bread. The chicken was tender, falling apart nicely with each bite, and light savory flavors worked well in this sandwich. The only problem I found was that perhaps I have a small mouth or something, cause this sandwich was so tall and difficult to eat! I found myself flipping it from top to bottom with every bite in order to keep it from being lopsided. 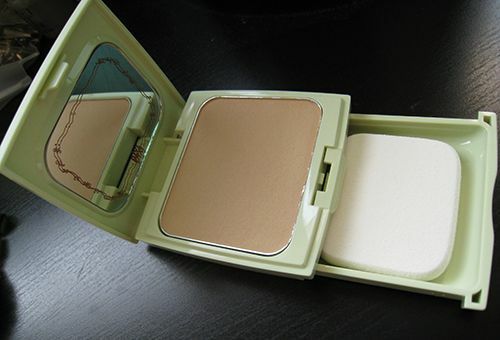 Flatten this baby down before eating. 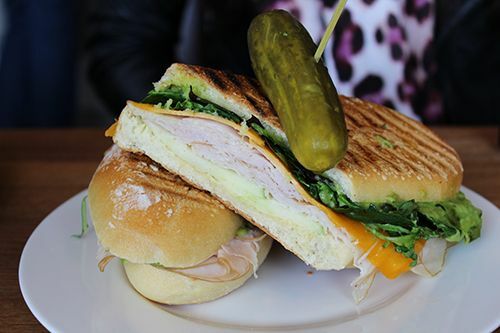 The Cheddar Apple Smoked Turkey sandwich ($8.75) was recommended to us by the server, and it was the best sandwich I've had of late. Seriously. Smoked turkey breast, sliced granny smith apple, avocado, mixed greens, cheddar, mayo and honey drizzle pressed between a crisp bun - I could eat this again and again. The light turkey breast and cheddar gave this sandwich a lot of flavor, and I loved the inclusion of the apple to give the mixture crunch and refreshing flavor. I think the crunch of the bread just made it that much better, making this sandwich a winner. So that comment about the sandwich being my second choice? That's because I originally ordered Red Velvet Crepes ($9.75) off the breakfast menu as my meal. Totally unhealthy for a main meal, but that's ok with me. 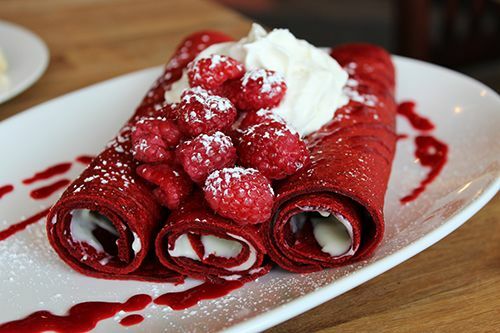 I had been expecting pillow soft, thin sheet of crepes filled with cream cheese mousse, fresh raspberries, and drizzled with raspberry coulis, but what sat in front of me on the dish was completely different. The crepe rolls were thick and dense, reminiscent of a roll cake, but not overly chewy, filled with lots of mousse and topped with whipped cream. It was definitely overly sweet to have for breakfast, but I wouldn't mind this at all for dessert. The dish was also served cold - warm it up and tone down the sugar a bit and I would be in dessert heaven. Having opened for just a few days, I'm pretty impressed with what Pure Kitchen has to order. Everything is made fresh and they're committed to sourcing ingredients locally, hence the higher prices. 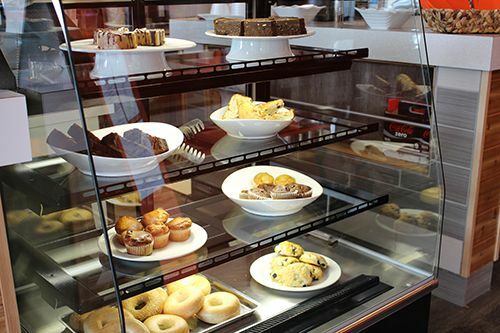 There's baked goodies made fresh in their kitchen to accommodate those that are gluten free, and many menu items can be made vegan or vegetarian. 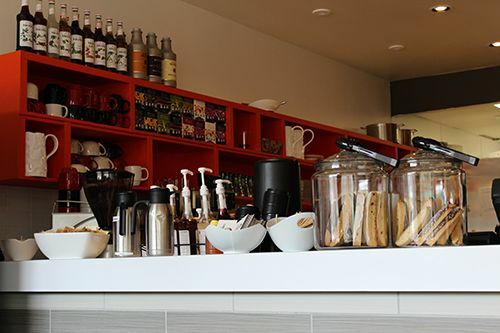 With Cherry Hill Coffee and a variety of teas on hand, stop by for a visit as early as 7AM on weekdays (9AM on weekends), or stay as late as 6PM! Frozen Yogurt shops are popping up all over Edmonton - like rapidly reproducing rabbits, except froyo is way more welcome. As a frozen yogurt fiend, I had to check out a shop that's open right by my house! Taste of Yogurt is located in a small old strip mall - I have many memories visiting the 7-Eleven in the same mall for slurpees in the summer, so it was a little nostalgic visiting this new froyo cafe. I was expecting a small little shop, but was surprised to find a well-lit, cozy yogurt shop with lots of variety and comfortable seating. 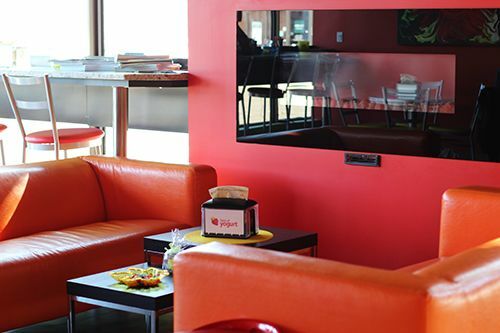 Tables and couches are decorated in their signature colours of red, orange, and green, and they offer free wifi on location, making me think this may be a great place to sit down to get some work done while enjoying frozen yogurt. The facility is clean, the staff are friendly, and with a big screen tv available for entertainment, children's birthday parties could be hosted here. 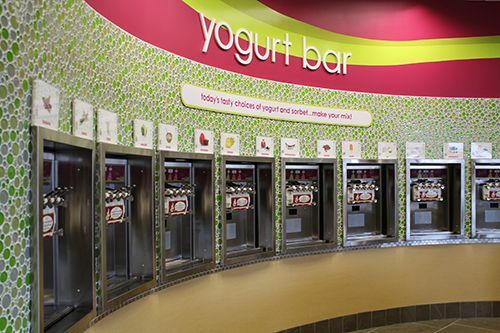 On any given day, 12 flavours of yogurt are available in a self-serve fashion, that can be topped with fresh fruit, candy, or syrup. 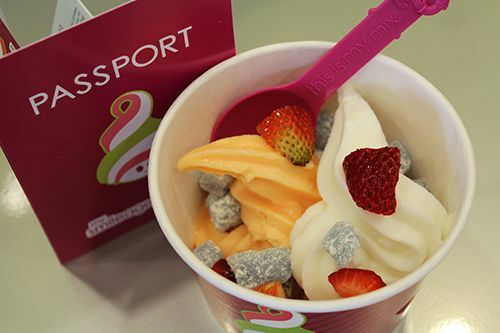 They charge cups of yogurt by weight at $0.54 per ounce, which is comparable to all other frozen yogurt shops in Edmonton. On the day of my visit, I chose to try out their original tart and salted caramel flavour, topped off with lychee boba, strawberries, blueberries and blackberries. One thing I noticed right off the bat was the creaminess of their yogurt - its much thicker and creamier, and less icy than what I have had in the past, making it more similar to the mouth feel of regular yogurt. The tart was tangy, and not as sweet as I prefer, while the salted caramel had a great toffee-like flavour, but was a little sweet for my taste. However, the fruit was very fresh and were great counterparts to the flavours I chose. While I sat down to enjoy my frozen yogurt, I had the chance to chat with Aneta, the owner of Taste of Yogurt. Being of Polish descent, she uses a European yogurt blend to make the soft-serve yogurt, which she prepares fresh daily. 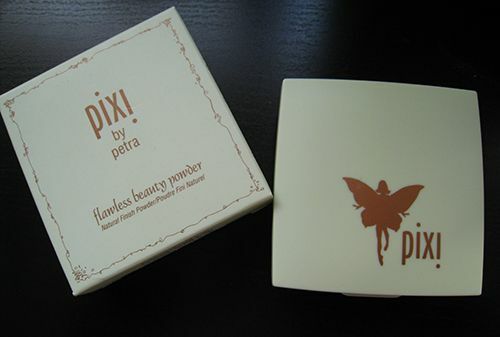 She believes that simple and fresh is best, and that is what she plans to offer to customers. Having opened just before the Albertan winter began, she has lots in store for the summer months. From fresh smoothies to waffles and crepes, the new offerings will make this little yogurt shop in the south side of Edmonton quite unique. During my visit, I had the opportunity to try out one of their new summer offerings: the Ukranian crepe. 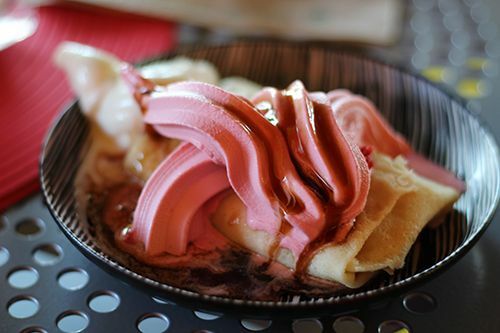 The dense crepe (made locally) is filled with dried blueberries, and topped off with your choice of frozen yogurt. In this case, Aneta paired the crepe with blueberry frozen yogurt and a Cabernet Sauvignon syrup - the crepe itself was a little tangy with the berries, while the yogurt and syrup gave it a complementing sweetness. While I can't say its my favourite yogurt in the city, Taste of Yogurt is a nearby option for me. It's a nice, cool treat with a creamy texture that will be perfect for the upcoming summer months - and probably healthier than slurpees at 7-Eleven (though I will have my fair share in the hot summer months). I'm most looking forward to the fresh waffles and smoothies they will be offering - I had a sip of a fruit smoothie and it was fantastic! For those of you interested, Taste of Yogurt is now offering a Groupon - click here for the details and give this southside shop a visit! 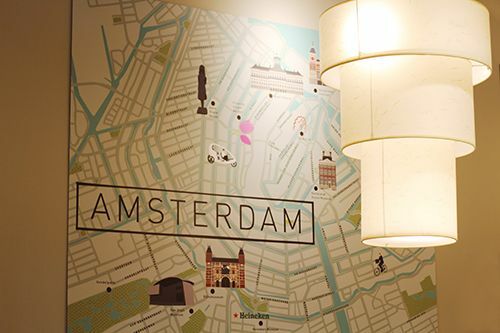 Not too long ago, the Vancouver based restaurant chain De Dutch stepped foot out of BC, opening its first franchise here in Alberta, and ever so conveniently they opened in Edmonton. Known for their special pannekoeken, or the Dutch pancakes, I knew I needed to make a visit for brunch to see the size of the pancakes with my own eyes. 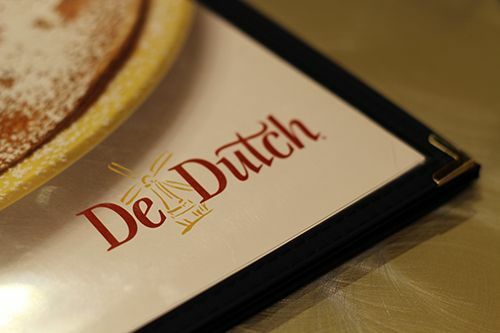 With all the construction going on in downtown Edmonton right now, De Dutch can be easy to miss. Once you find it hidden behind construction barriers, you step into a warm, cozy restaurant bustling with activity. Standing by the front entrance, the restaurant doesn't seem too big. But take a walk, and you'll see that the place extends quite far into the back of the building, with plenty of space to accomodate bigger groups. At 12:45 on a Saturday, the restaurant was quite busy - they do not take reservations, but were told that business typically slows down around 12:30 and it shouldn't be hard to find a table during that time. My friend Aubrey and I were seated right by the fireplace in the brightly lit space, and given lots of time to look over the menu. 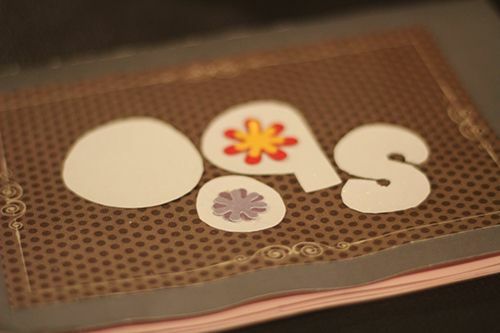 Trust me, there's so much to take in on the menu that it's almost overwhelming to have to choose just one thing! Of course I was most interested in the pannekoek selection, which had both savoury and sweet options, but for those of you looking for something different, De Dutch offers eggs benedict, omelettes with toast, burgers, sandwiches, and more. There's probably something for everyone on that menu! This restaurant claims that their 12" diameter plate sized pancakes that are paper thin can be cut into 113 square inch bites! Crazy, right? While many pannekoek choices on the menu called our names, both of us settled for savoury options. The Windmill: shaved smoked wild BC salmon, Edam and hollandaise sauce came to our table, looking plain and not too interesting. 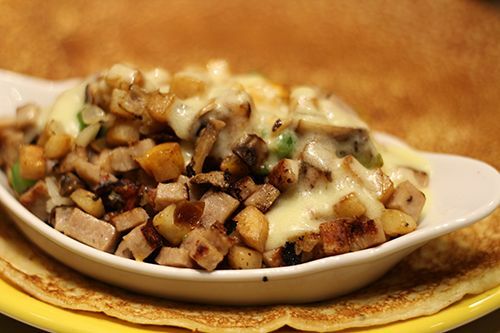 The pannekoek itself was plain with little flavour, with all the savoury notes coming from the toppings. The flavours did work well, and the hollandaise tied it all together, but it was missing that wow factor for me. I chose to go with The Hash: hash browns, mushroom, green pepper, onion and cheddar mixed with sausage & hollandaise sauce. The meat option in this dish can be replaced with your choice of ham, DeBakon, turkey bacon, or be served without meat to make it vegetarian. I was really surprised with just how big of a portion the hash was, sitting in its bowl on top of my pannekoek. Like Aubrey's, the pancake itself was bland, relying on the hash to give the whole dish its flavour. The hash had a nice ratio of veg:meat, but for my tastes, the dish needed more moisture. Having to eat such a huge pancake and not have extra sauce to spare while eating it was a little difficult, and the waitress brought by some Franks Red Hot Chili Sauce for me. I probably should've asked for some hollandaise on the side - and would recommend this if you ever order The Hash! Having finally tried the Dutch pancake, it's definitely something different if you're looking to change up your brunch routine. 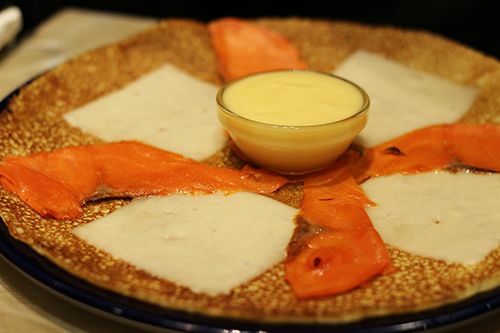 What bothers me a little bit is the presentation of dishes on top of the pancake - I don't know what surfaces the dishes have touched, and they could potentially transfer some types of germs onto the pannekoek. It's a little off putting, and if it's a concern for you, make sure to let your server know in advance to serve the dishes separately. Price wise, you're looking to pay about $10-$17 for your pannekoek, which can be a bit on the expensive side, but it is a unique concept and something to try out. When I go back, I'm going to take a stab at the sweet pannekoeken with syrup - and portions are big, so you're definitely not going to be left hungry! I'm going to tell you about a secret of mine.. there's a cute Taiwanese cafe in the south side that I love, and I think makes the best bubble tea in the city. I'm there at least once every 1-2 weeks cause I've been obsessed ever since I've found this place! Oops Tea is located in a strip mall along Calgary Trail, often missed as its in the middle of the mall located on a very busy street. When I first discovered this cafe last summer, it actually happened to replace Green's, which was another bubble tea place I quite enjoyed. When you walk in, you're greeted by the friendly staff at the desk, and you have the option to stay or order to go. 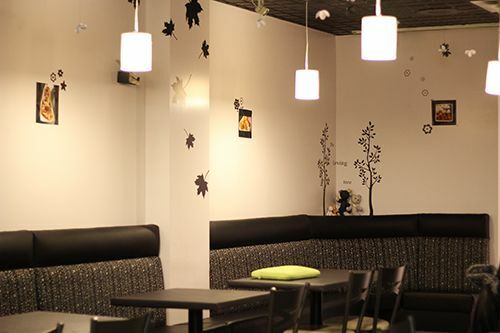 The interior features dimmer lighting and cozy seating, while the walls are decorated with leaves and trees, and crocheted bears sit along the walls. It's a really nice environment to sit in, as it's calming and I would say I can see myself sitting there to get some work done. I love that the owners are Taiwanese and Oops Tea offers some traditional dishes with authentic flavours. 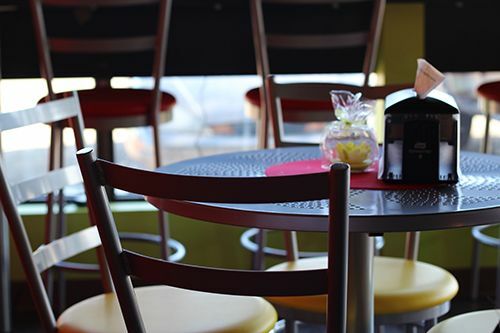 The menu offers a wide variety of drinks, and food options ranging from snacks, to meals and dessert. On this particular visit, I was with great company and we were able to order a ton of dishes to try and share. 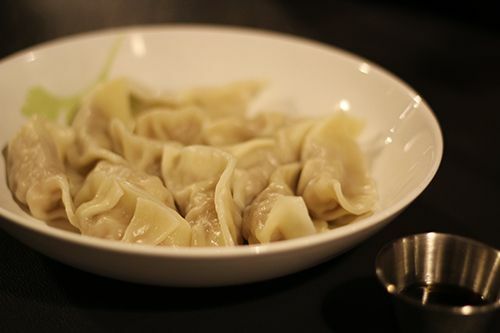 To start off, we had an order of their dumplings to share. The meat:veggie ratio was spot on, and the skin was nice and thin so it wouldn't stick to your teeth. It was served with a sesame oil & soy sauce to dip into, and these were pretty tasty. They were reminiscent of dumplings my grandma would make then I was young. 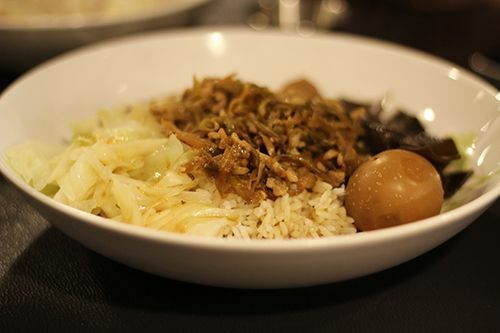 For meal options, a Zha Cai Pork on Rice ($5.75) was ordered at our table. 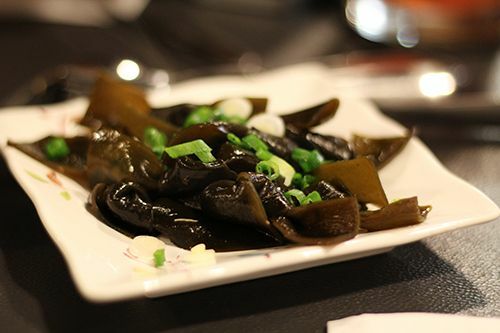 Zha Cai is a preserved vegetable which is salty and spicy, which really hits the spot when you're craving something savoury. We discovered that you could actually upgrade your order and make it a combo for $4 more, which gives you a couple sides to go with your dish. 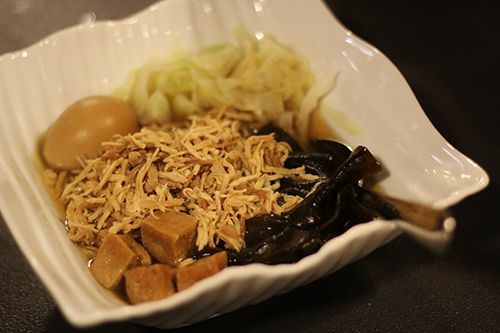 You get all five sides, which include tofu cakes, seaweed ties, a braised egg, vegetables and more rice and meat to your dish. Totally worth the $4 value and this dish tasted great! One of the reasons why I keep coming back to Oops Tea is for one drink: the original bubble milk tea. 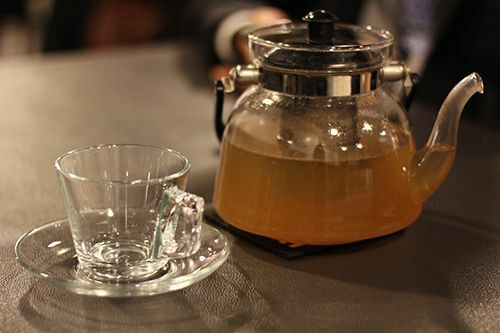 I believe that their blend of tea leaves and use of honey make this one the best in the city. 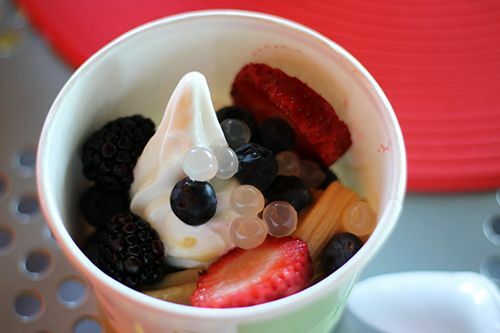 It has the perfect sweetness, and not to mention they cook their tapioca pearls to perfection! 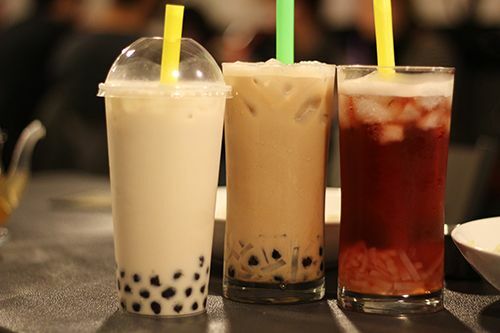 I love chewy tapioca, and it goes great with all their drinks. Another drink I particularly love is the Lychee Green Tea - everyone I've bought it for has always loved it! 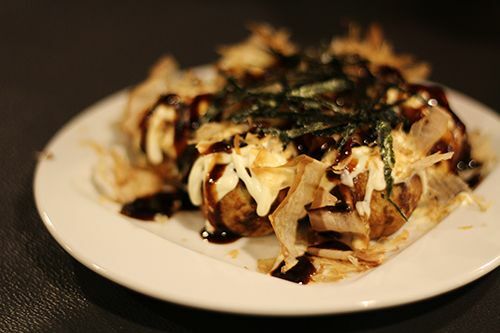 Another fun dish to order and share is their take on Takoyaki ($9.99 for 7 pieces), topped with mayo, seaweed and bonito flakes. This dish was served hot to the table, and the portion size was pretty big. I like my takoyaki to have more filling on the interior, and these ones unfortunately had more dough to them. Otherwise, there was quite a bit of dressing but the flavour was great. For myself, I tried out their Fried Rice Noodles ($7.99), which turned out to be fried thin glass noodles/vermicelli with cabbage, carrots, sliced shiitake mushrooms, and preserved vegetables. They definitely use the Chinese "Master Sauce" in frying this dish, and I love the degree to which you can taste the star anise. 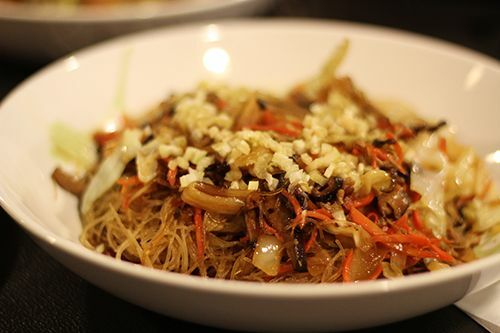 It's a meal in itself, and I definitely recommend this dish if you love fried vermicelli! Last but not least, I had to have a side order of their seaweed ties ($2.99/15 pieces). I love seaweed anything, and these ones didn't have too much of a briny taste, but were cooked a bit soft for my liking. They were marinated in a soy sauce and were a great snack - I just wish they had more of a bite to them! Oops Tea is a great place for a late night snack and bubble tea with friends. Like I said, I've been back many times just for their milk tea as they're on my way home to the south side. The location is convenient with lots of parking, and they are open from the early afternoon into the evening everyday except Tuesdays. The staff are friendly and the space is cozy - just make sure to bring cash or debit along with you as they don't accept credit!